As autumn sets in and days get shorter, temperatures – cooler, and sweaters – thicker, food cravings change as well. Salads are often replaced by heartier vegetables – cooked, warm, flavorful. Baking frequency goes up. Instead of strawberry shortcake, you might want to make an apple pie. Instead of a spinach salad, you might crave a spinakopita. And perhaps grilled chicken is replaced by a stew with a myriad of spices and flavors. I have noticed that I am always in search of recipes that combine sweet, sour, bitter, and salty. Perhaps this is why I am such a fan of Thai food. I’m practically a permanent fixture at a nearby restaurant. Overall, and especially for stews, I prefer to use the dark meat to white meat because of how much flavor it contains. Legs and thighs on a chicken have more muscle, therefore more blood, and thus more flavor. The breast, while considered a “healthier” choice tastes bland to me. No matter how you cook it, I’ll always eye the dark meat on any bird, be it chicken, duck or turkey. Another great thing about this recipe is its one-pot functionality. This is great for those with small kitchens or who are easily overwhelmed with having several pots to watch at one time. For novice cooks, this is almost fool-proof, especially if you follow the dark meat route. The meat will become juicy and tender, practically falling off the bone. If you’re disgusted by the idea of eating gizzards and hearts, then simply substitute that portion with more chicken. As a Russian, I cannot discard that part of my upbringing. And what a great surprise it was when I cautiously mentioned to my boyfriend that there were organs in the stew and that he didn’t have to have any, and he was elated because he grew up eating them too! 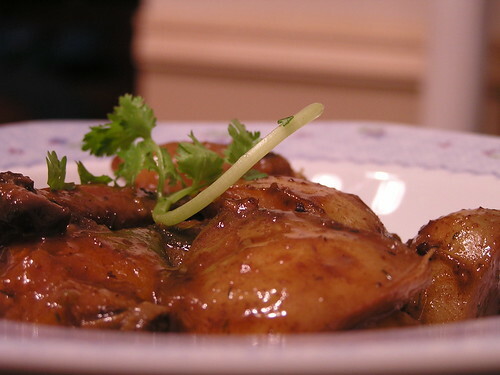 If you’ve never tried gizzards or hearts, I’ll say that it’s extremely flavorful. I happen to love it, but it’s a matter of taste and what you’re used to. Overall, this is fun and easy to make. And it fills your kitchen and house with warm, cozy smells of fall and familiarity. It’s a perfect meal to eat on your couch watching a movie or a game or just hanging out with a few friends. Grab a few deep bowls and enjoy! Crush the garlic and warm it in olive oil in a large non-stick pot (a cast-iron pot is ideal) – the warming of garlic also flavors the oil and prevents the garlic from burning. Place the when the garlic has cooked sufficiently, but not burned, remove it and place the onions into oil. While sautéing the onions, add the spices one by one to create almost a spice rub. All the spices will blend together and create a consistent coating for the chicken. Add the chicken – let it brown on all sides before adding other ingredients. Once the chicken has browned, place the rest of the ingredients inside the pot. Cover the pot and cook on medium heat until enough liquid gathers on the bottom to almost braise the meat. Lower the heat to low and cook for 90 minutes. The longer the slow cooking time, the deeper the flavors will be. Mmmm.. this makes me hungry..